The City Mini GT Single takes multi-terrain strolling to the next level with all-terrain capacities and luxurious standard features in a chic compact package. Its easy-to-use design and all terrain tires make it perfect for both every day excursions in the urban jungle and weekend adventures off the beaten path. The City Mini GT features patented Quick-Fold Technology with removable auto-lock to keep stroller closed when folded, accessory mounting bracket, a flip-flop friendly hand-operated parking brake and an adjustable handlebar to accommodate users of all heights. The 8.5" quick-release forever-air wheels won't leave you flat and feature sealed ball bearings, front wheel suspension and lockable swivel front wheel for long distance strolling. 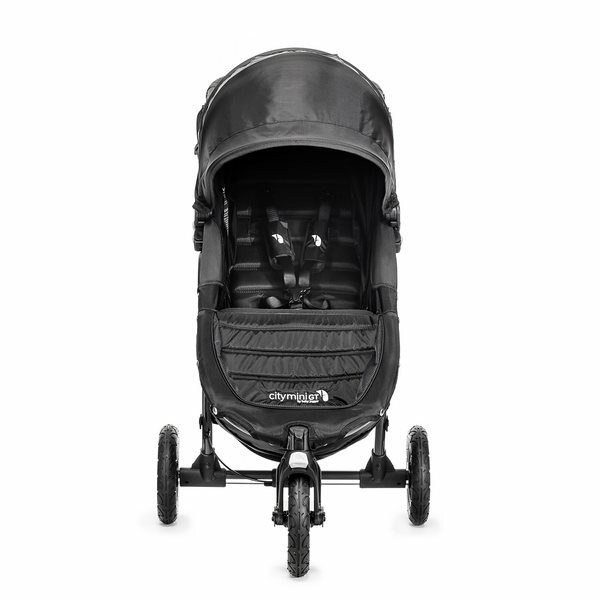 The supportive plush padded seat reclines to a near flat position and features a vented seat top to increase airflow within the stroller with retractable weather shield to cover the mesh in inclement weather. The City Mini GT's roomy seat also features a taller seat back and longer foot well to accommodate taller children. Also featured is an adjustable sun canopy with peek-a-boo windows, an adjustable five-point safety harness with shoulder pads and buckle cover, a large and easy to access under seat basket, a seat back storage compartment and a rear parking brake. The City Mini GT is the next generation in all-terrain strolling with all the safety and style you'd expect from Baby Jogger. Maximum weight capacity of the City Mini GT Single is 65 lbs. This stroller is not intended for jogging.